A quick tip: What to do when the image has areas of strong contrasting light. 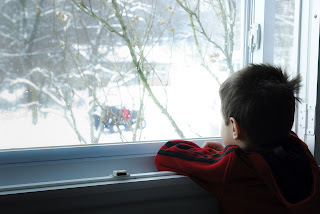 In this image my grandson was looking out the window into the blinding snow storm. This type of image creates an extreme challenge because if I expose for the outdoors then the indoor part of the image [my grandson] would be underexposed. If I expose for my grandson then the outdoor part of the image is 'blown out' or way to light to make out any detail. What do you do? In this image I exposed for my grandson's left cheek. I wanted to ensure as much detail of his face is preserved as possible. I always shoot in RAW and process the images in Lightroom which permits a tremendous amount of latitude for image processing. Once the image was in LR, I used the adjustment brush and the graduated filter tool to darken the outside portion of the image. Years from now, we will look back at this image and remember the snow storm of Jan 09. Remember, go out and capture the beauty of life!